Quantum the Time Travelling Train brought everyone to Porta Susa, but he was grumbling. "I can never find my way around this station." "The Wabbit sensed irony. "Don't worry," he said, "neither can anyone else." Skratch the Cat hopped onto Quantum's footplate and carried out basic maintenance, while the team planned the next move. "How many Stone investments have been made so far?" asked the Wabbit. "About sixty four," answered Skratch, "we can't keep up with demand." "Skim anything off the top?" asked the Wabbit. "Just expenses." "Then lodge it in the Dinosaur Fund," said Wabsworth, "we may need more copies of the Stone." "But what happens next?" asked Lapinette. "We call a special investors' meeting," said Jenny the Pirate. "We imply extra profits." "Admission is granted to putative investors," continued Skratch, "so all the MacDrabs have to attend." Lapinette looked around and pointed into the distance "I can see MacDrabs over there." 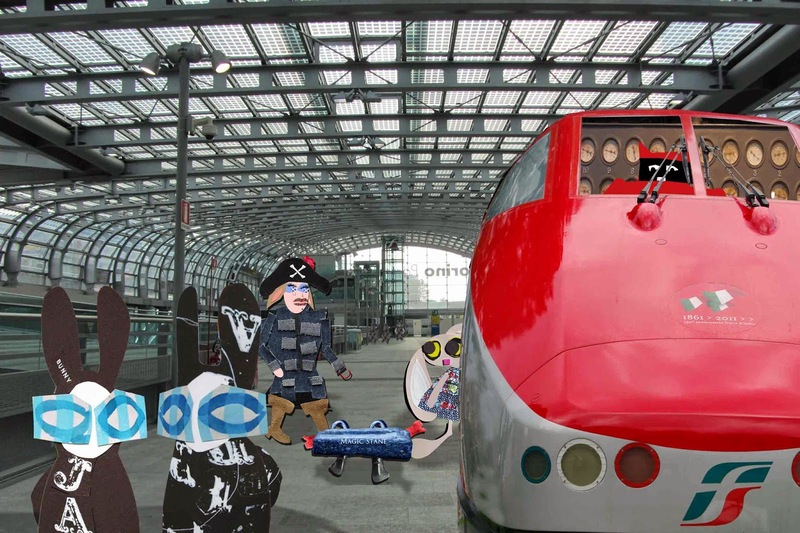 "They're lost," said the Wabbit. Jenny laughed. "We'll help them find a way out." "Sonny," said Stone. "Once we get them together in the meeting, what happens?" "Apologies for absence," said the Wabbit. "Then minutes of the last meeting, then ... a Negative Earnings Surprise." His eyes twinkled and he laughed. "Then and only then do we reach Any Other Business." Lapinette raised an eye. "Is there any?" "Yes," smiled the Wabbit. "Kaboom!"